Once you are satisfied with your selections and are ready to make a purchase, if you have selected to pay via credit card, you will be prompted to enter your credit card information. If not, you will skip directly to entering your Billing Address. Note: Currently Aurora Systems is only able to accept VISA cards. If you do not have a VISA card, please go back and select a different Payment Means. Aurora's online purchasing is secured by industry standard 1024-bit RSA encryption. We take extra steps to protect your credit card information, ensuring it is always encrypted from the time you submit your order, even after it has been transmitted to Aurora Systems servers. Enter the number from your VISA card. Select the month and year that your VISA card is good thru. Select the month and year that your VISA card is good from. This is optional, however it may help prevent submission of an invalid card. The Card Verification Value (CVV) is the three digit number from the back of your VISA card as shown in the picture. The CVV is optional, but it can help speed credit card processing. Press this button to confirm your selection and move to the next step. 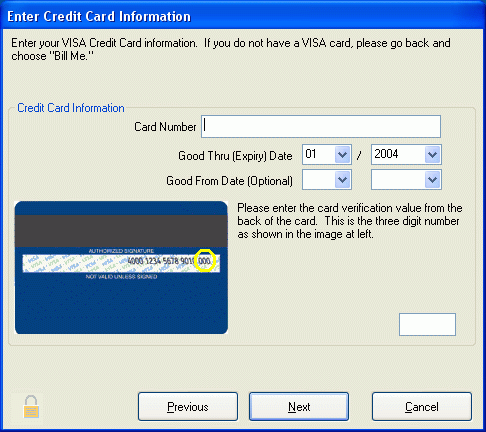 If the card number or good thru date is invalid you will not be able to proceed. If the good thru date is correct and Aurora Suite will still not let you continue, check that the date on your computer is set correctly.